This originally appeared on Best Classic Bands in 2015. We’re grateful to Blunstone for granting us one of our first interviews and we congratulate the Zombies for their 2019 Rock Hall induction. “There’s nothing else like it in the world,” Zombies frontman Colin Blunstone says of South by Southwest, the long-running annual music-industry confab in Austin, Texas, where the classic rock legends spent the better part of a week performing live and making all manner of promotional appearances. While SXSW is a favored destination for unsigned bands looking for a record deal and developing acts promoting their new releases, it’s a seemingly unlikely vehicle for a group that scored its first hit more than half a century ago. But for this, their second visit to SXSW, Blunstone and co-founding keyboard/songwriter Rod Argent, both of whom are pushing 70, have taken on a hectic work schedule that might daunt musicians a third of their age. 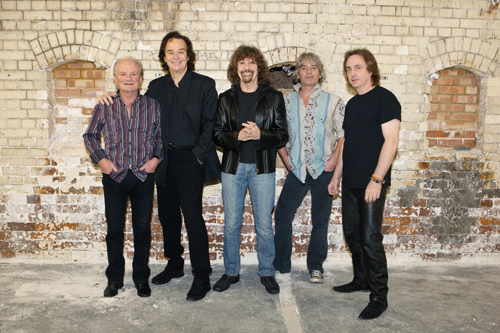 The Zombies current lineup also includes longtime Argent associate and former Kinks member Jim Rodford on bass, plus Rodford’s son Steve on drums and guitarist Tom Toomey. During their five days in Austin, they played no fewer than six live sets in a diverse assortment of venues and undertook an assortment of media interviews, radio sessions and personal appearances. “Our American agents, TCI, felt that it would be a good way to draw attention to the fact that we’re still playing live, and to remind people that we’re still writing and recording new songs,” Blunstone notes. Indeed, one of the main points of the group’s SXSW agenda is to build interest in the new album that they’re currently recording with producer Chris Potter, best known for his work with The Verve and Richard Ashcroft. 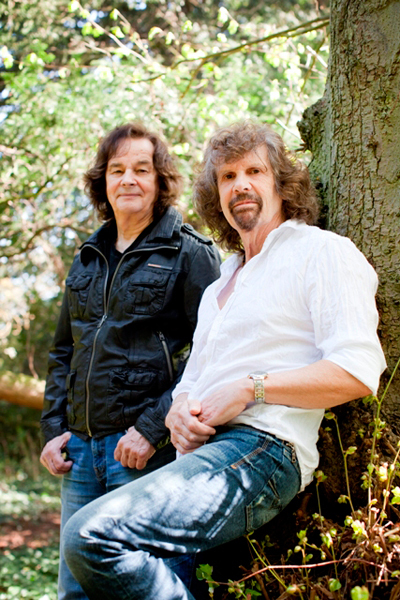 The Zombies’ all-in approach to SXSW is consistent with the work ethic that Blunstone and Argent have maintained since they reunited in 2001. 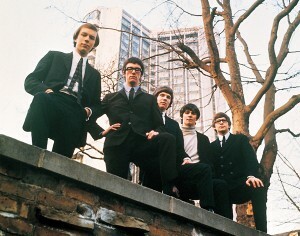 Although the pair initially intended to do a short series of U.K. gigs, the temporary reunion soon became a permanent one, and before long the two British Invasion survivors were touring and recording under the Zombies banner. Since then, they’ve maintained a busy touring schedule in the U.S. and overseas, released three albums of new material, and reconnected with the other surviving original Zombies members for some 40th-anniversary U.K. performances of the band’s 1968 baroque-pop cult classic Odessey and Oracle. It’s not surprising that the Odessey and Oracle numbers met with rapturous crowd responses throughout SXSW, as do the 1964-1965 hits “She’s Not There” and “Tell Her No.” What’s more impressive is the demographics of that week’s audiences, which largely consisted of twenty- and thirty-somethings, a large percentage of whom seem startlingly conversant with the Zombies catalog. The quintet kicked off the week on a Tuesday night in front of a particularly youthful audience at a Rolling Stone party at Mellow Johnny’s Bike Shop, a sprawling hipster cycling emporium, where the crowd goes nuts when the band introduces a trio of new tunes, “Maybe Tomorrow,” “Edge of the Rainbow” and “Moving On.” That pattern will continue for the rest of the week, in contrast to the more common sight of fans grudgingly tolerating new material while waiting to hear the hits. After spending most of Wednesday doing radio, video and online interviews, Blunstone and Argent started their Thursday with a short duo set as part of a Converse-sponsored Kids Rock benefit at the Fader Fort pop-up party space, playing stripped-down versions of “She’s Not There” and “Time of the Season” in front of an audience of young children and their parents. After participating on the aforementioned “50 Years of The Who” panel, Argent putting in an appearance at the Hammond booth at SXSW’s Music Gear Expo. The band and crew head for the Zombies’ official showcase at Stubb’s BBQ’s 2200-capacity backyard amphitheater, where the group will play to its biggest and loudest house of the week. Their 7:00 set time at Stubb’s, as the first of nine acts on the bill, allows the Zombies their one proper soundcheck of the week. When they kick off their set with the 1965 b-side “I Love You,” they’re facing a sparse crowd. By the time they finish their second number “I Want You Back Again,” another 1965 single which they’re re-recording for the new album, the outdoor space is filling up, ecstatic and wholly devoid of the jaded cynicism one might normally associate with music biz gatherings. In contrast to Stubb’s and the theaters and large clubs where the Zombies usually perform while on tour, many of the band’s SXSW spaces are improvised stages in venues that don’t normally host live music. On Friday afternoon, playing on a makeshift stage at music-streaming company DeliRadio’s party at the Jackalope, a longstanding beer-and-burger bar on Austin’s infamous Sixth Street, the quintet battles sound problems, uncooperative gear and a cramped space, yet pulls off their set with their usual unflappable professionalism. “It was tested a little bit on that one, to be honest,” Blunstone admits, adding, “Most of the venues we played during South by Southwest were fantastic, but there were one or two that were a little bit challenging. But I always say that the guys in this band are bombproof; just put anything in front of them and they’ll get through it. We know what we’re there for, so we just get on with it. Sometimes when people are shouting at you and everyone’s in a hurry, it’s easy to let things get to you. But you just have to stay calm and make the best of it, and remember why you’re there. A few hours after surviving their Jackalope ordeal, the rain that’s been coming down for most of the afternoon eases up enough to allow the band (and its gear) to remain dry enough to get through a set as part of the long-running outdoor South by San Jose series on an outdoor stage adjoining the retro-cool Hotel San Jose and local java institution Jo’s Coffee. The persistent drizzle fails to dampen the spirits of the audience – which contains a sizable contingent of local civilians, since it’s open to the public, unlike most SXSW events – and The Zombies are greeted with the same love they’ve been seeing all week. With their Whole Foods set putting an exhilarating cap on their Austin visit, the Zombies seem to have accomplished their SXSW goals. They generated considerable press and word-of-mouth, ignited interest in their forthcoming release and left a positive impression on a few thousand listeners, many of whom will presumably return to their respective hometowns and spread the word. Now it’s back to England to resume work on the new album, whose introduction to the marketplace will presumably be eased by the time and effort that the band has invested at SXSW. “The whole experience was just so frenetic and crazy, but it was an absolute thrill being in the middle of it all,” Blunstone concludes. Scott Schinder has written written about music and popular culture for various publications in the U.S. and overseas, including Rolling Stone, Creem, Entertainment Weekly, Billboard, Time Out New York, Newsday, Stereophile, Musician, Tower Pulse, New Musical Express, Melody Maker and Texas Music. He's also written several music-related books and liner notes for numerous CD reissues and box sets and has contributed essays and other pieces to several other books, including all six editions of The Trouser Press Record Guide.